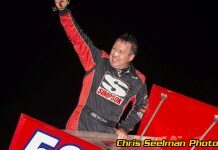 OCALA, FL – In the spirit of the Winter Olympic games, Tyler Courtney’s performance on Saturday night at Bubba Raceway Park could only be described as flawless – even coming from the Russian judge. No, you won’t find any triple axels or double lutzes in his 30-lap performance, but you will find the precise execution of a race where nary a single wheel was turned wrong lap-after-lap on his way to a commanding USAC AMSOIL Sprint Car National Championship feature win, his second in as many nights at “Winter Dirt Games” in his Clauson Marshall Newman Racing/Priority Aviation – Competition Suspension, Inc./Spike/Rider Chevy. From the drop of the green, pole sitter Courtney checked out, last seen headed northbound on I-75 out of Ocala carrying the winner’s check under his arm. Only Chris Windom was able to present a brief challenge in the early stages of the event before falling back into line. Windom, the defending series champ, charged from fifth to second on the opening lap past a stout group that included C.J. Leary, Chad Boespflug and Dave Darland. Yet, by midway, Courtney had ridden the cushion to more than a half-straightaway lead over Windom, who could never get close enough to present a challenge to Courtney in a race that went caution-free for the final 27 laps following a lap three caution for the stoppage of Garrett Aitken. When all was said and done, Courtney wrapped up a dominating 2.5 second victory over Windom, Boespflug, Kevin Thomas, Jr. and Darland to become the first driver to win back-to-back USAC AMSOIL National Sprint Car features this early in the season since Tracy Hines in 2013. “Winter Dirt Games” is unique in that it is almost like a mini-season within a season. It’s a three-race excursion separated on its own island on the schedule in the month of February, preceding the bulk of the season which typically gets underway in late March, early April. 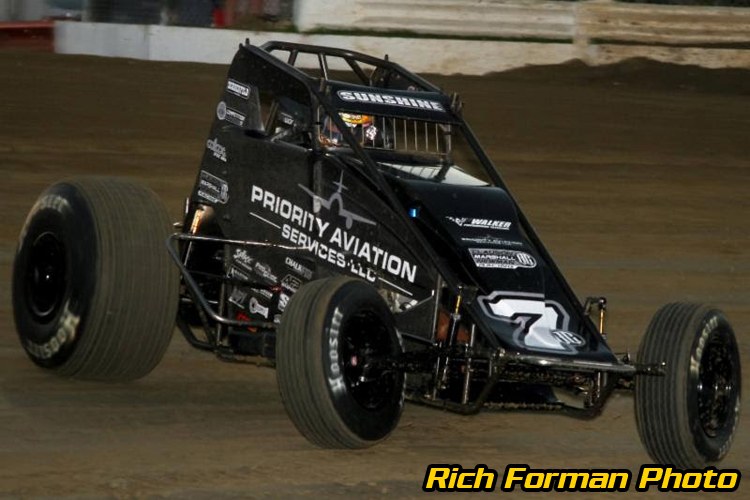 In this case, it’s a full six weeks until the next series event, March 31 at Indiana’s Lawrenceburg Speedway. There may not be much, mechanically-speaking, that a team can take away from what they learned at a uniquely-shaped venue such as the 3/8-mile D-shaped track at Bubba Raceway Park and apply it to the high-banks of Lawrenceburg, but there are certain aspects of it that a driver and crew can learn from each other that will benefit them when the season gets in full swing despite the substantial time off over the next month-and-a-half. 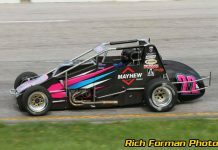 After a relatively rough showing, and an 11th place finish in Thursday night’s season opener, Courtney and CMNR found something amongst themselves. Contingency award winners Saturday night at Bubba Raceway Park include Kevin Thomas, Jr. (Indiana Mafia Fast Qualifier), Robert Ballou (Simpson Race Products First Heat Winner), Kody Swanson (Competition Suspension, Inc. Second Heat Winner), Timmy Buckwalter (Chalk Stix Third Heat Winner), Tyler Courtney (Indy Race Parts Fourth Heat Winner), Chris Windom (KSE Racing Products/ProSource Hard Charger), Kyle Cummins (Wilwood Brakes 13th Place Finisher), Johnny Petrozelle (Saldana Racing Products First Non-Transfer), Mario Clouser (ProSource Hard Work Award) and Isaac Chapple (Roger & Barb Tapy 13th Fastest Qualifier). QUALIFYING: 1. Kevin Thomas, Jr., 69, Dynamics-13.900; 2. Chris Windom, 5, Baldwin-14.033; 3. Logan Seavey, 5B, Briscoe-14.094; 4. C.J. Leary, 30, Leary-14.241; 5. Dave Darland, 36D, Goodnight/Curb-Agajanian-14.249; 6. Justin Grant, 4, TOPP-14.274; 7. Chad Boespflug, 98, NineEight-14.275; 8. Tyler Courtney, 7BC, Clauson/Marshall/Newman-14.312; 9. Robert Ballou, 12, Ballou-14.343; 10. Kyle Cummins, 3c, EZR/Cummins-14.375; 11. Carson Short, 21, RCM-14.375; 12. 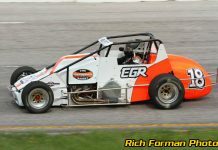 Brady Bacon, 63, Dooling-Hayward/RCR-14.412; 13. Isaac Chapple, 52, LNR/Chapple-14.439; 14. Jarett Andretti, 18, Andretti-14.458; 15. Chase Stockon, 32, 32 TBI-14.482; 16. Nick Bilbee, 2E, Epperson-14.483; 17. Kent Schmidt, 5K, Schmidt-14.492; 18. Kody Swanson, 3R, Rock Steady-14.675; 19. Timmy Buckwalter, 7, LNB-14.707; 20. Garrett Aitken, 32A, Aitken-14.860; 21. Brandon Mattox, 28, Mattox-14.863; 22. Mike Martin, 16, Martin-14.887; 23. Landon Simon, 24, LSR-14.924; 24. Johnny Petrozelle, 59, Petrozelle-15.007; 25. Mario Clouser, 6, MCM-15.078; 26. Robert Bell, 71, Bell-15.330; 27. Slater Helt, 22s, Helt-15.355; 28. Frank Carlsson, 20, Carlsson-16.271. FEATURE LAP LEADERS: Laps 1-30 Courtney. NEW USAC AMSOIL SPRINT CAR NATIONAL CHAMPIONSHIP POINTS: 1-Thomas-227, 2-Windom-219, 3-Courtney-209, 4-Boespflug-182, 5-Leary-179, 6-Cummins-172, 7-Stockon-170, 8-Ballou-170, 9-Grant-168, 10-Short-164.